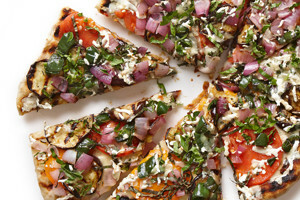 A sprinkling of fresh basil complements the smoky grilled vegetables in this pizza. Prepare a medium-high (400°F to 475°F) charcoal or gas grill fire. Oil the grate. Generously brush the onion, eggplant, and poblano slices with olive oil and sprinkle with salt and pepper. Grill the vegetables, turning occasionally, until charred and tender, 6 to 8 minutes. Transfer the vegetables to a cutting board as they are done. Coarsely chop the onion and pepper. In a medium bowl, combine the cheeses and rosemary. On a generously floured pizza peel or large cutting board, stretch or roll the dough to an approximately 10 x 14-inch rectangle. Brush dough with olive oil. Using both hands, set the pizza dough onto the grill grate. Cook, covered on the gas grill, until the top of the pizza starts to bubble and the bottom gets nice grill marks (but does not burn), 3 to 4 minutes. If the dough appears to be burning, reduce the heat on the gas grill to medium or transfer the dough to the cooler part of the charcoal fire. Brush surface of dough with olive oil and flip, using tongs and a large metal spatula (one in each hand). Transfer it to the cooler part of the fire if cooking over charcoal, or reduce the heat to medium low on a gas grill. Distribute half of the cheese mixture on the dough, top with the sliced tomatoes and grilled vegetables, then half of the basil and the remaining cheese mixture. Close the lid and cook for 6 to 8 minutes, or until the cheese has melted. Transfer the pizza to a cutting board, and drizzle with olive oil and the remaining basil. Slice and serve.